Click here to read about the experiences of the 2018 Design Den Maker Interns! What will I do as a Design Den Maker Intern? 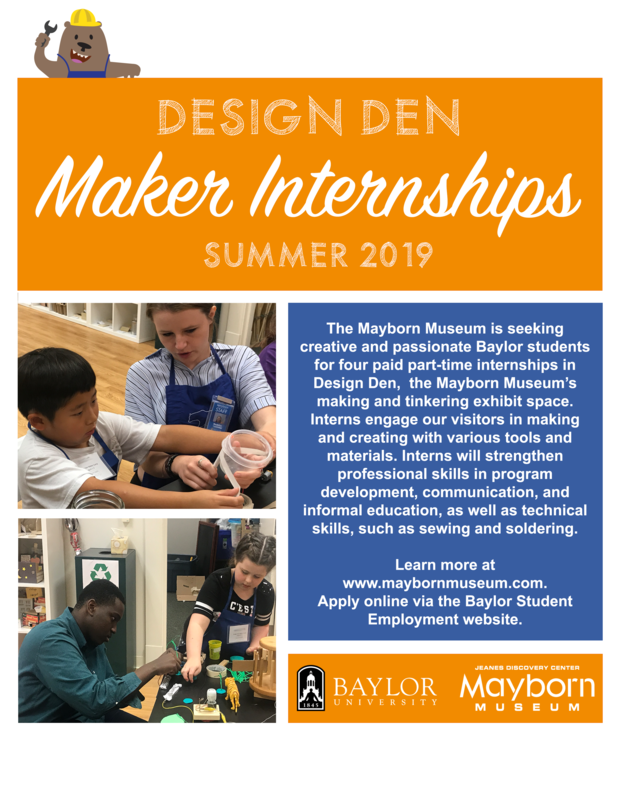 Maker Interns will work in the Mayborn's making and tinkering exhibit space, Design Den. In addition to developing and facilitating programs here at the museum and out in the Waco community, Maker Interns will attend weekly professional trainings, and have the opportunity to incorporate personal projects and hobbies into museum programming. What are some activities and programs that happen in Design Den? Design Den Maker Internships are paid for 20 hours per week for 11 weeks. For summer 2019, the internship will start on May 28 and end on August 9. Applications will be open March 29-April 25 through the Office of Student Employment. Click here to sign in and view student job listings. You must be a Baylor student to apply. For questions about application website, please contact the Office of Student Employment.